This thread contains comments for the article "Connecting the Radio" posted on MySensors.org. If you are powering the device by batteries, I'd suggest to avoid electrolytic decoupling capacitors and go for ceramic or film one since the latter have a smaller leakage current, avoiding battery drain. Don't forget the antenna if you use a RFM69 or you may damage your device. @FotoFieber - Good one, I added the warning on the build site. Might be good with a antenna wire-cutting guide for different frequencies as well. @hek - I can look into that. I'm using the Arduino Micro with al NRF24L01 radio. With the micro it's not posible to use the pin config of the Nano. I got it working with the connections below. Thereby I put the code below in my arduino code before de "#include <SPI.h>"
Maybe this is helpful for some other users. "try adding a decoupling capacitor of 4.7µ - 47µF (the exact size usually doesn't matter)"
I can use 4.7µ or 47µ only ? or a size between 4.7 and 47 ? @carmelo42 Any size between 4.7µ any 47µ will be fine. Can I use a RFM69HCW as radio? Yes you can. Use the same pins for Nano. I used RFM69 with Arduino before and a library where I have to initialize the radio with the frequency (868MHZ in my case) Does the mysensors library work for all frequencies of RFM69 without telling it which frequency to use? before including MySensors.h in your sketch. See https://github.com/mysensors/MySensors/blob/a31eff112e4895198bf6ec385fdeedb2910bb628/MyConfig.h#L588 for valid settings. I've got a Micro DHT sensor ans a Uno Ethernet Gateway. So I think this is nice but I'm not complete sure. To me it seems that the sensor cannot get a good connection to the gateway by the RF connection. The physical distance between de two RF modules is about 15 cm and I'm using a 10uF condensator on both of the RF modules. @DiverAlpha try moving the nodes further apart. It might be counter-intuitive, but many have had problems when nodes are too close. Do you get nothing at all in the log of the gateway when the sensor tries to find parent? @mfalkvidd, They are now 2 meters apart from each other but still the same problem. I was thinking in this direction also but because I build those two on the same breadboard, it was a bit difficult to separate them. I now build the sensor on another breadboard and moved is 2 meters away. It can't be any longer because of the length of my USB cables. All the logging I got from the gateway is posted in my previous post. So there is nothing about any child in there. I am no expert in this. But when I started using MySensors few months ago, I also had some problems. Not because there is a problem with MySensors but because I was doing the simplest of the mistakes and I needed to think simple and do simple things first. What I would suggest is just try the simplest of the code first. This post is considering that you are using MySensors library 2.0. This is what I did when I was trying out MySensors and I think you can try this too. Firstly connect Arduino you are using properly to the radio with the proper connections using the instructions here. If you are using Arduino Mega, the SPI pins are different. Here is the link for Arduino Mega: https://forum.mysensors.org/topic/4940/arduino-mega-nrf-wiring/3. Make sure you have decoupling capacitors attached between the VCC and GND pins of both the radios. After you make the connections upload the code for the gateway to one of the Arduinos. You can find the code in Arduino IDE, File > Examples > MySensors > GatewaySerial. Don't make any changes just upload the code. Then what I did the first time is just run the following motion sensor code to the other Arduino. I have made a few changes to make things simpler for the node to find the gateway. Here, I have defined a NODE ID and defined the PARENT NODE ID for the node. Defining parent ID makes sure that the gateway that you have is the one, the node is supposed to connect to. I didn't even have motion sensor connected to the node here. This is just to make sure that first time you get everything working. If this is done correctly the node and gateway should talk to each other and gateway should have the motion sensor registered. Thanks for your help. Unfortunately it didn't solved the problem :-(. I tried it on my setup. The node shows the output with BC (st=bc) when I only have the node connected in that is powered ON. But when I power ON my gateway in they start communicating and I get st=ok. Basically you need to have at least one node and a gateway working for MySensors to run properly. Read last few comments, you will get the idea of what I am saying. You can also try the fix for this suggested by ayo in the comment #35. I have a RFM69HCW and was getting a terrible connection from 5 meters through two thin walls. The connection and range is incredible! I live in an appartment 3rd floor, put a node in my mailbox which is 15 meters below and still got sensor data. how long is real range on radio RFM69HW ? It is better than NRF24L01 ? Yes, generally, lower frequency -> longer range (but also lower transmission speed). But speed RFM69HW is too slow ? For use it to relay switch and some sensors... ? What is better to home automation ? RFM69HW or NRF24L01 ? I want to use these radio's indoors and need to have a good connection through a couple of thin walls. My impression is that the RFM69 has at least better wall penetration. I'm using the RFM69HCW 868Mhz with only a 82mm wire connected to the ANT pin. I tested the Mock sketch and enabled a few mock sensors. Throughout my appartment I have no problem having a good connection. But, there are fake NRF24L01+ chips out there which might be the cause of my penetration connections errors. When uusing RFM69HW i must also use Capacitor as for NRF24L01 ? I do not think that the RFM69HW is as sensitive as the NRF24L01 but adding a Capacitor will not hurt. It also depends on how clean your power source is. If the power is clean you do not need to filter it using Capacitor. @ZsoltZombori what does the serial debug output of the nodes say? How i must change sketch Gateway and node to use radio RFM69HW ? In sketch i see only for simple RFM69 not RFM69HW. Do you add the rfm69hw def to the gateway sketch or to the myconfig.h? Will a RFM69HW work without the "#define MY_IS_RFM69HW" ? What exactly does this #define do for the HW version? Have only used RFM69W so far but have ordered some HW now also. Also, for using RFM69H you need this define,else the radio can't work properly. This allow us to set the right Radio power level registers in lib. @korttoma just curious Have you tried my rfm69 repo? So does a H version radio work if you do not set the high power registers? Sorry, I have not yet had the opportunity to test your repo. There is so much non MySensors activities now when Christmas is approaching. @pepson if you're using an Arduino Mini pro or equivalent, and follow the recommanded wiring for the radio (CS and INT), looks ok to me. Now i test it on Arduino nano byt finally i want use it on Arduino Mini Pro. Wirering i use as show on this page. @pepson oki. But you've not explained what's your problem, without logs etc..
Now any problem. I only need info how write sketch to use radio RFM69HW. Is there an instruction to alter the power level on the RFM69? From inside a mysensors sketch like the NRF24_PA_level? Try the MockMySensors.ino sketch and enable a few sensors. However if I use the Mysensor libraries for the SerialGateway and the door sensor I don't even get 1 meter. I tried to declare these variables as well but no success. Any suggestions I might try out? Solved. This is the extra variables for the RFM69H / HW versions and to set the frequency. So it seems that 868MHZ is the default value. I m getting symbols when I send Hello World message from Arduino Uno to an Arduino Pro Mini (5V). Yes I have put an input of 3.3V to the pro mini. Baud rate used is 9600. Any clue why this is happening? I can provide the code. @LaMB95 are you using a Pro Mini 5V 16MHz or Pro Mini 3.3V 8MHz? If the wrong variant is selected in the Arduino IDE, all timings will be off, including the timings for serial communication. I have an arduino pro mini 5V. But I have attached a breakout CP2102 usb connection to it. On the board there is a 3.3V point which I have plugged in as Vcc to the NRF24L01+ module. To upload the code I have selected the 5V 16Mhz as processor. @LaMB95 Interesting. I have never seen a 5V Pro Mini with 3.3V output. Where did you get it? Try different serial speeds in the serial monitor and see if you get something readable. No, it isn't that easy. To improve your NRF, please have a look at https://forum.mysensors.org/topic/1851/extending-range-of-regular-nrf24l01. I tried solution Nr. 2. It is easy to do and cheap. Improvements are noticeable but not dramatically. In regard to effort it is worth trying. If you aimed at changing NRF's frequency - no this is not possible at all. Base frequencies are selected within the chip itself and antenna resonant frequency has to match oscillator frequency. @mfalkvidd Haha not really a 3.3 output I changed its input voltge to 3.3 hoping it would work. But nevertheless I managed to solve the issue. It seems to be an error in the Hardware serial. The code bhagman has posted worked ! It worked yesterday now I am back to the same problem. It seems that the FRM69 library set the IRQ pin as optionnal. Can someone confirm that the IRQ pin is mandatory ? Well, I had a look in RFM69 driver, and it seems that the interrupts handlers are never sets ? Edit : In facts, DIO0 is not used as an Interrupt source in RFM69 driver : it's a pin that informs the library that, either, a packet has been received, or , the frame we try to send has been sent. So, the code doesn't use interrupts, but this pin is more a "Data available" pin. Yes I noticed it ! Since it didn't mention IRQ pin, I didn't seen it at first ! What misleaded me, is that on LowPowerLab forums, some users says that you can absolutely discard this interrupt and poll the radio frequently to ask if a packet is available. where can I find the picture for connecting NRF to arduino uno? @siddmon to my knowledge, Arduino Uno the same pins as on Arduino Nano, Arduino Pro Mini and all other atmega328-based Arduino boards. @mfalkvidd Thanks and yes, they have the same pins, I didn't see Uno in the table so I google it and got incorrect instructions. @siddmon great! Thanks for reporting back. Little mistake in the text, I don't think dupont cables are made of bread. "the antenna need to be single core inside, only one wire, not multi-wire breaded like you can find in common dupont cable (not good for antenna.)" "The antenna need to be single core inside, only one wire, not multi-wire braided like you can find in common dupont cable (not good for antenna)"
@nitroburn thanks! I've updated the page. @mfalkvidd No problem, did make me a little hungry though. @Grave thanks for pointing this out. From looking at the source code, it looks like it should be MY_RFM69_CS_PIN. I have updated the text. Could you check if I got it right? The problem is that nrf24 have many crappy clones that have limited range and it is difficult to find the original ones. Rfm69 is slower but have better wall penetration and modules come in 3 frequencies. @joseyapor neither is better. They are good at different things. See https://forum.mysensors.org/topic/3993/nordic-or-hoperf-radio/2 for an earlier discussion. It looks like that MY_RFM69_CS_PIN is used only in develop branch. Stable brach still using MY_RF69_SPI_CS. Hmm.... Is not that a reference to the development branch? If you don´t believe it, try to download a stable branch, unpack and search for string "MY_RFM69_CS_PIN". @RAD-X yes, you are correct. Thanks for noticing. I thought that if I selected the master branch on github and used the search function, the search results would only show hits from the selected branch. But it seems like this is not the case. Linking to a specific line in a file doesn't work very well, because that line might move by later commits. That's why I select a specific commit to link to. But as you point out, my link points to a commit in the development branch. The correct link is https://github.com/mysensors/MySensors/blob/8bb3cfb2e14214ae19e8531c989d1e81c9660614/MyConfig.h#L663 and there is indeed no support for MY_RFM69_CS_PIN. I'll update the documentation again. The documentation is meant to reflect the current stable branch. Only the default branch is considered. So there is no way to search in the stable branch. 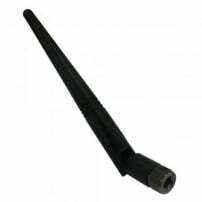 I have one question regarding the length of the 868MHz antenna. According to the theory, a the wavelength of a 868Mhz signal is 300/868 = 34.6 mm, so a quarter wave antenna should be 8.6mm long. The table above indicates 8.2mm. May someone confirm the correct figure, and also indicate how critical is that difference in terms of range? 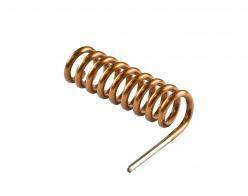 @manutremo the speed of electromagnetic waves is slower in metal than in vacuum, that's why the length is shorter. My experience is that the length doesn't need to be exact, but antenna theory is way too complicated for me to understand the details. Many thanks @mfalkvidd . That explains it. While waiting for an answer I also found some sites which mention that the speed of electromagnetic waves is even slower if the conductor has an isolation layer around, which would further justify the difference. @manutremo I think that part is due to skin effect. @mfalkvidd Many thanks again... I learn new things every day. I tried 3 types of antennas with RFM69HCW 868mhz. Indoor in my appartement (one floor) it doesn't matter which one I use. All is working fine. I tried 2 nodes in my metal mailbox 10 meters below which has 2 tiny holes. One with helical antenna, one with sma antenna. Gateway (using sma antenna) receives no data. Testing two repeater nodes (1 helical, 1 sma antenna) near a window I receive data via both repeaters. Sometimes the repeater with sma antenna is not relaying messages for the node with the sma antenna. In my situation, the helical antenna works better for me. I just buy them on ebay. Maybe the sma antenna is for the wrong frequency and it's giving poor results.